On Dec. 21, a crew from W.L. Thomas Environmental was finishing up the removal of asbestos in the three houses. The proposed demolition of three old Albany houses remains hung up at the state Land Use Board of Appeals because of procedural objections by an opponent. To refresh your memory, the city council voted 4-2 in October to let the owners raze the houses at Fourth and Calapooia three months later, hoping the delay would allow time for alternatives, such as moving at least one of the structures. Owners Mark and Tina Siegner posted signs offering to sell the houses for $1 for anyone who could move them by Jan. 11, 2019, the earliest date they could be demolished. On Oct. 31, one day before the deadline, a Portland attorney for Albany resident Bernadette Niederer, whose online profile identified her as a vice president of the Monteith Historical Society, appealed the council’s decision to LUBA. The city responded by submitting a record of the decision, which after further procedural steps would eventually allow the board to reach a decision. Albany had 14 days to file a response. As of this morning, LUBA had not received any. LUBA has 60 days from the 12th to rule on the objection. Once the Siegners determined that the decrepit houses they bought last February were too far gone to economically restore, they had hoped to replace them with new housing designed to be compatible with the Monteith Historic District in which they sit. Good reason for abolishing the Landmark commission. The delay is stupid and absurd. So, the complaint is about writing style, not content. That’s likely not substantive. I’ve dealt with contracts that declare headings and paragraph numbering as conveniences, not essential elements. This is the first of many paper cuts that prevent the property owners moving on. The property taxes should be exempt until the property can be used. The city has too many people holding things up for no reasonable excuse. The house on the corner dates from 1858. It was there when Lincoln and Douglas were debating the slavery issue in our country. It predates statehood for Oregon and the transcontinental railroad. 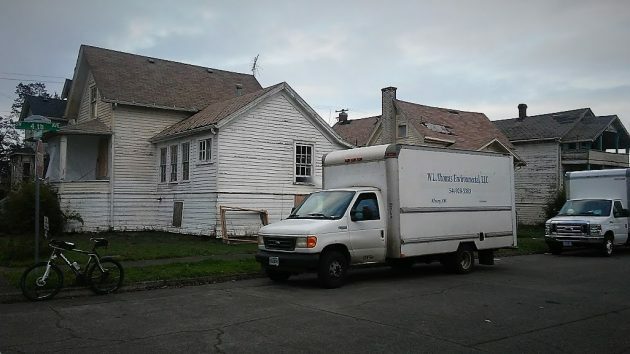 It’s a good example of a pioneer Oregon house and I appreciate the Historical Society’s questioning its demolition. So why don’t you buy it and rehab it. It’s a total piece of junk much like my old body. Because they refuse to separate the lots and sell it individually. They’ll sell it for one penny but the stipulation is that the house MUST be moved. If they would be willing to look into dividing the lots into three and selling that house separately then someone could look into it. If you subscribe to Olsen’s logic, no building anywhere inside Albany would ever be knocked down because all buildings have a history. All buildings were created during an important historical period, depending on one’s perspective. In this instance, Historical Society types have become the property police, terrorizing property owners by filing endless appeals to save their precious historical vision. I don’t recollect them debating on the steps of that old house. If someone wants to build something that fits in with the structures in the neighborhood, why not. I’d be more concerned with getting all those side streets in that part of town. Every Meeting of CARA a quotation from the movie “Chinatown” comes to mind. Only sometimes that is just not true, sometimes those buildings have deteriorated into junk. The buildings in question are not to that point and they CAN be rehabilitated! Evidently the Monteith Hysterical Society’s website is out of date, or Niederer is lying. Niederer’s name is not listed as a Board Officer. Why assume anybody is “lying”? The online resume that identified her (note the past tense) as VP of the Monteith Historical Society says it was “modified” on Aug. 19, 2015. So it’s at least that old. Fair question, and thanks for adding the additional info. I’ve been watching way too much CNN lately. I’ll be more careful reading your words next time. Let’s be clear. An individual who claimed no organizational affiliation has objected to the Siegner plan. Got that. Shadle assumes someone is lying. Chill dude. I don’t like that citizen’s objection, but she is allowed an opinion. Disagreements are rarely founded in lies. More often in misunderstanding. Does it matter? She could be the pope and have no more power in this decision than any citizen. Hopefully the Siegners can sue her for punitive damages since she put her name on the obstructionist document. No lawsuit. Appeals are provided for in the law and have been for decades. Amazing how conservatives seem willing to ignore the law if they see an opportunity to arbitrarily punish someone they don’t agree with. A lot of that going on in the White House these days. If its historic, and not just because of the date it was built, why not have someone research the owner, who they were and what they did in the community? I for one don’t currently see the historic connection just because the house is old. We have a ton of historic homes here in Albany. I think we need to let the property owners use the property as they have planned. Historic property owners get significant tax breaks and other assistance for rehabing or maintaining historic properties. In return, they abide by a stricter set of standards and requirements than ordinary non-historic property owners. They made the decision. It’s fair. So how much money should they be forced to lose to get this “tax break”? Zero. They buy the property then apply for the tax deferment. These homes were illegally used for years with no regard for zoning laws and literally trashed. And yet now all of the sudden historic landmarks. What a joke! No one from the city listened while these now “beloved” homes were being destroyed. Seems like the City, the County and the so-called Commissions are content to gaze backwards and long for some mythical time when this little slice of Oregon was “better” than it is now, requiring preservation so that we can be reminded. Navel gazing is the term that seems most appropriate. Meanwhile, City streets are a hazard, schools are failing and the homeless are thick as rabbits, requiring the authorities to issue tickets for attempting to exist outdoors. Our leaders should consider the here-and-now to be at least as significant as a rotting building. If nobody will buy them for a dollar, the Siegner’s have a liability rather than an asset on their hands (also helping explain the low price they paid for the property). A fair exchange would be a payment by them of the would-be demolition cost to anyone who successfully removes the house(s). Maybe, that would help preserve at least one of them. Otherwise, move on in reasonable time. I love how the leftest on here find ways to take jabs at conservatives. Keep your politics out of these discussions. They don’t belong here! Guess I don’t read folks the same way. This is an odd case in that “progressives” and “conservatives” are having a sound discussion without labels. I’m glad you love something ;-) If politics doesn’t belong here, where does it belong? On red-only or blue-only forums? The only problem is dishonest politics, like when the same person posts under multiple names, the equivalent of “vote early and vote often.” (I don’t suspect you). If the owners truly wished to walk away from the problem, they could elect not to pay their property taxes; thereby, allowing the county/city to foreclose. The Owners could Quit Claim Deed the Property to the Monteith Historical Society for $10. Make it their problem. most Land Grant Universities in the US have property offices. Donate the entire property to Oregon State University to…make it their problem. ‘cept they paid real money upfront. A mission benefited, but that wasn’t a charitable contribution. The only historical provenance seems to be age. Historicity only came into play when the Seigners wanted to make a profit. Dang it, instead of requiring them to enjoy a sh85 sandwich, let them move on. The obvious solution is, from Hasso’s perspective, to keep this mild controversy bubbling for as long as possible to keep the bourgeois agitated. This pitiful saga, pitting nameless, faceless government bureaucrats against heroic American Entrepreneurs, with a side-order of nosey Landmark Commissions, fee-seeking attorneys and their overfed clients, is the perfect fodder for a rag like this one. Hering is outperforming the Albany Daily Bird Cage Liner, capturing Lord knows how many reader eyeballs. Based on the information provided to us at council, I honestly believe that from the get-go, they had absolutely no intention whatsoever in trying to rehab the properties. I stated my reasons at the meeting… So, the process as made available is playing out – as it should. Whatever side one comes down on, this really should be a local issue. What is the State doing in the middle of it? Exactly, exactly the BS people with any clue whatsoever see thru. Seigners are in it to make as much money as possible, as most of us would be. That doesn’t mean these places can’t be saved, and for less. It does mean they (the Seigners) will make it look impossible.